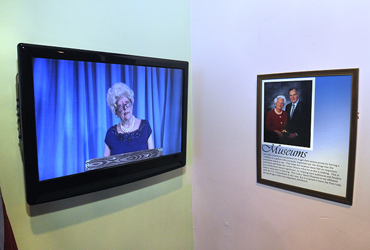 Installation view of Martha Wilson as Barbara Bush. Acknowledging that institutions are performative, authority is performative, and the idea of an artifact is a cultural construct, a show about what happens when you write a letter on the back of an image and send it in the mail must be a show about constructions. In 1898 the US Congress passed a law designating that the postal service would thereafter be required to deliver as mail any letter written on a certain type of paper of a certain size with an image on it. The postcard was created by an act of Congress and when hundreds of thousands of them were sent from Coney Island in a single summer, it was because the US government had sanctioned it. But what happened when individuals chose to write their stories on an image and send it to each other was something new. This exhibition explored the relationship between performance and identity, both for institutions and for individuals.